We are offering Liquid Soap Dispenser to our clients. We are sharply indulged in the offering of Desired Automatic Soap Dispensers of different sizes. These dispensers are reliable and nice in look. Optimal in working, these offered products are reliable in nature and supplied to the customers in safe packing to keep away from scratches and other damage. Container - 18-8 S, type-304, 18-gauge (1.0 mm) stainless steel with satin-finish. Body is drawn, one-piece, seamless construction. 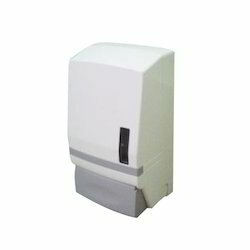 Automatic Soap Dispensers, Capacity: 0.8L, Material: Aluminum/ABS, Finish: Chrome/Black. We offer high quality foam soap dispenser. It is known for high level of hygiene and easy maintenance.The products are durable, cost effective and hygienic and are offered to our esteemed customers at industry leading prices. With our economy burgeoning and our lifestyle becoming more and more modern, people are seeking a higher quality of life. People expect the same levels of public hygiene in washrooms as they have in their washrooms at home. This demands high levels of hygiene care for organizations and institutions today.